Autograph Letter Signed from Sir Gerald Campbell ('Gerald Campbell') to Ernest Gye of the Foreign Office, on his posting to Tangier. 'New York', on H.M. Government letterhead; 11 January 1933. 2 pp, 12mo. 18 lines. Text clear and complete. Very good, on lightly-aged paper. Addressed to 'My dear Ernest'. The news that Gye has been posted to Damascus is 'exciting', although 'it will be funny & deserted - like to come home & not find you at the seat of custom'. Gye had spoken of going abroad, so he was not surprised, '& Lady Armstrong said recently that you were about to seek another field'. Regarding Gye's painting, he 'will have lots of interesting things to limn (that's a good word)'. Autograph Letter Signed from Sir Gilbert Mackereth ('Gilbert Mackereth'), British Consul at Damascus, to Ernest Gye of the Foreign Office, on his posting to Tangier, and including a discussion of British artists there. On letterheads of the British Consulate, Damascus; 21 January 1933. 8 pp, 12mo. 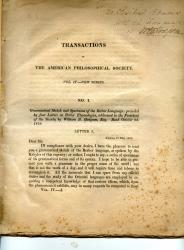 In very good condition, on lightly-aged paper. Addressed to 'Dear Ernest'. He begins by congratulating Gye on his promotion and 'on going to Tangier - a delightful spot'. It is however 'very sad' that Gye's 'guiding hand over our destinies will no longer be there in the Office'. He thanks Gye for his 'kindness' and 'sympathy': 'My path has lain along uneventful ways and it has been an untold solace to feel you did not despise those who had mearly [sic] to 'stand & wait''. Grammatical Sketch and Specimens of the Berber Language: preceded by four Letters on Berber Etymologies . . .Read October 2nd, 1829. 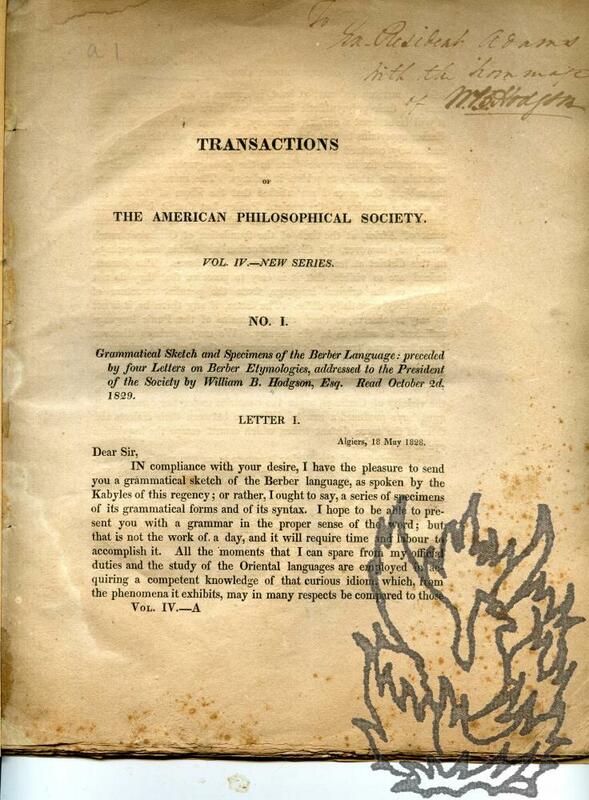 Offprint, "Transactions of the American Philosophical Society", vol.iv, New Series, brown paper wraps, 48pp., 4to, two one-word corrections in Hodgson's hand, some foxing, marginal chipping of page edges, fair. INSCRIBED "To President Adams | With the hommage | of W B Hodgson". Note: Hodgson served in the State Department through the influence of Henry Clay who, when secretary of state in Adams's administration, "assigned Hodgson to the Barbary States . . ."